I know to really participate in the Ravellenic games, one is meant to join a team and sign up for a competition, etc., etc. 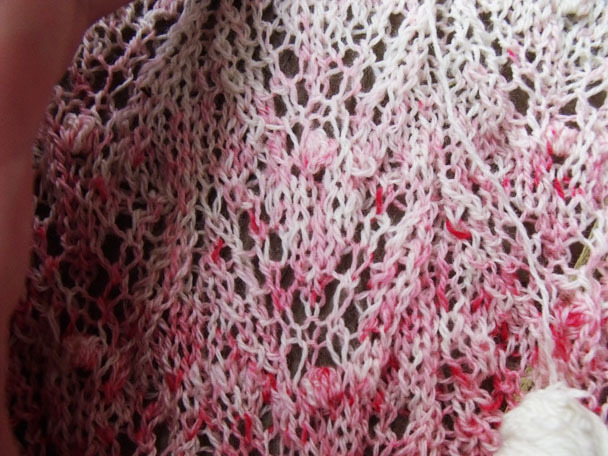 I still wanted to give myself a knitting challenge, and I am taking this challenge just as seriously as though who signed up officially, but the truth is that internet forums have been leaving a bad taste in my mouth lately. Yes, even on Ravelry, and it makes me sad. So, this Olympics, I am avoiding the forums part of the knitting games and just doing it on my own. I chose Anne Hanson’s Motheye as my project. 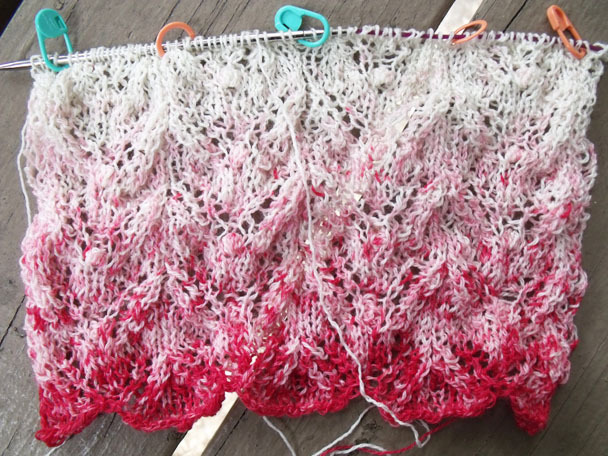 I have really knit a lace scarf, and I have yet to successfully complete a project out of lace weight yarn. So, I threw my balled-up yarn from my ripped out Starling, which I will finish one day when I have the patience to dye the yarn first, in a pot full of red dye. This is the effect it’s having on the pattern. This was just a little ball of yarn, a little snag in the ripping out I couldn’t untangle, and the white shouldn’t last much longer before it runs out. Even now, I can feel myself growing bored with the undyed yarn, and am thinking of switching to the bigger ball. The big ball should have a much larger red section, and therefore a longer transition. We’ll see how it goes. However, I am still enamored of my Pearl Street Pullover out of undyed yarn. Perhaps it is the cables rather than the color? I do love the nupps! Nupps are another thing I have never knit. I like them and am dreaming of pairing them with cables sometime in the near future. Or do they become baubles when the are with cables. Is there a difference? There is much I still have to learn about knitting. More on that later. The suspense, it should be driving you mad.